Had just about 4 hours before we left. G mentioned that we were invited to watch a match at a friend's place. Hmmm.. been wanting to make this cake for some time now. Got all the ingredients, but I had no pecans.. should I just substitute it for walnuts? Naah.. I don't know if I would ever have a second take on this, so might as well do it right. Then rushed to Publix and got not only the pecans, but more Ghirardelli chocolate, because of a wonderful twist from David Lebovitz's version. So.. we know that this cake does not originate in Germany (where coconut is not native to the country), and that the name actually comes from Samuel German, an employee at the Walter Baker & Company. He may not have realised this recipe is now a classic.. and certainly is a keeper for me. Needless to say, it was a hit at home and at the match. 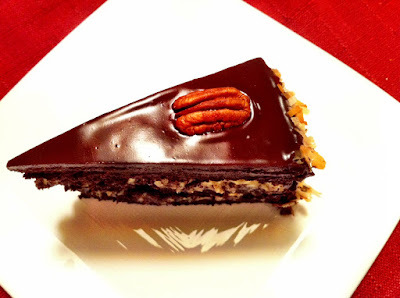 This recipe was adapted from Joy of Baking, a long time favorite blog of mine. 1. Preheat oven to 350F or 175C (you can toast the pecans while the oven preheats as well). 2. Butter, then dust with flour, or line 3 8inch or 20cm round cake pans with parchment paper. 3. In a heatproof bowl 1, melt the chocolate, then allow to cool to room temperature. 4. In a large bowl 2, sift the flour, cocoa, baking powder, baking soda and salt. 5. In a small bowl 3, combine the coffee (or boiling water) and buttermilk. 6. In bowl 4 with the mixer, beat the butter until smooth and creamy, then add sugar until the mixture is light and fluffy, about 3-5 minutes. 7. Add the eggs to the mixing bowl, one at a time, then the vanilla extract. 8. In alternate additions, mix in the coffee/buttermilk and the flour, in 6 batches, beating only until incorporated. 9. Fold in the melted chocolate with a wooden spoon. 10. Divide the batter among the 3 pans. 11. Bake for about 30-35 minutes or until 'toothpick done' and the top springs back when lightly pressed. 12. Let cool in the pan for a few minutes, then invert on a wire rack to cool completely, parchment side down. 13. After cakes have cooled, brush rum on exposed side. 3. In a medium saucepan, combine sugar, milk, egg yolks, butter and salt. 4. Cook over medium heat until mixture begins to boil, stirring continuously, and when thickened, stir in the pecans, coconut, rum and vanilla extract. 1. Place the chocolate in a bowl with the butter. 2. Heat the cream in a small saucepan until just beginning to boil, stirring often. 3. Remove from heat and pour over the chocolate. 4. Stir until smooth (then add up to 4 tbsp of rum) and cool to room temperature. 2. 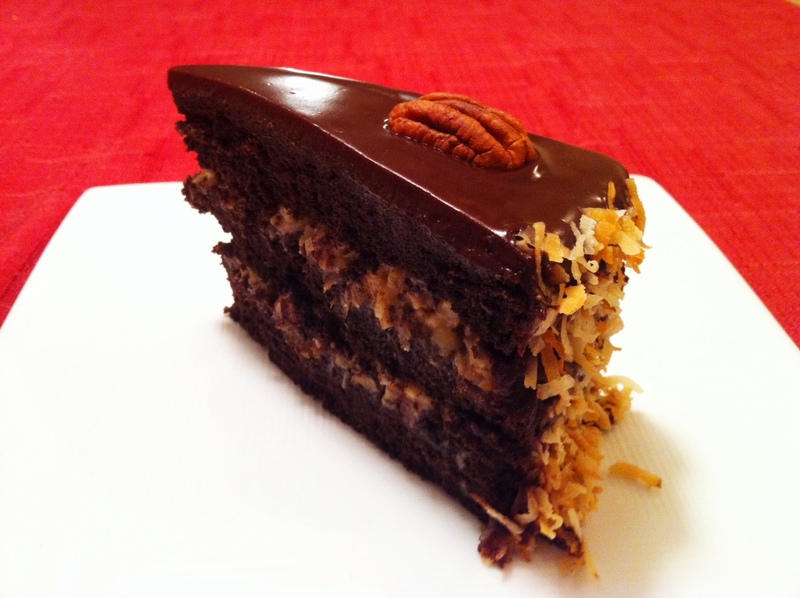 Spread half of the coconut pecan frosting, then top with another cake layer, and a brushing of rum. 3. Spread the remaining frosting and top with the last cake layer and a generous brushing of rum as well. Make sure all the edges are filled with the frosting. 4. Pour the chocolate icing on top, letting it drip on the sides, and covering the sides completely. 5. Before it sets, pat on the toasted coconut flakes on the sides. 6. Finish with a 'perfect' pecan on top of each slice.